So far, the configuration needs to be done on an external file. Now there is an opportunity to create or to remove existing assignments under the new options. 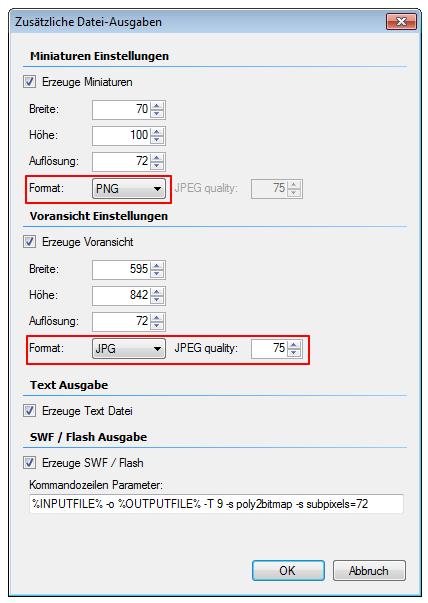 For the image–preview and Miniature of the original file now can be set the file format (PNG / JPEG) and JPEG quality (from 0 to 100% – default = 75%). Previously, the information was fixed preassigned for the PDF info field “PDF generator” with “FileconverterPro – www.fileconverterpro.at“. This information can now be freely configured. Now File Converter Pro can be transparently integrated into other solutions as an add-on or OEM product, since the PDFs generated with FCPro can be reported as created by this application. FC pro is often used as an external service that runs on a central computer. The processed data is transferred to this service, converted and then are available for download. To keep these files is not (too long) out of control of the leading system, these files / jobs can be deleted as quickly and reliably on the FCPro server after processing. There is already an option when uploading the file to delete the files immediately and automatically after downloading. Only a single download the files is possible. If this parameter is not specified, the job is retained depending on FCPro configuration for x days at the server. During this period the generated files can be downloaded again. If “0 Days” is configured, the jobs are deleted an hour after you upload automatically. There are also 2 other methods “GetResult” and “GetResultEx” which have the same parameters. It is possible to create multiple output files during conversion. These have been differed with an ID (= number). Now it is also possible to identify these files on a label and then download. The label texts are currently assigned fix, but will also be freely configured in a future release. 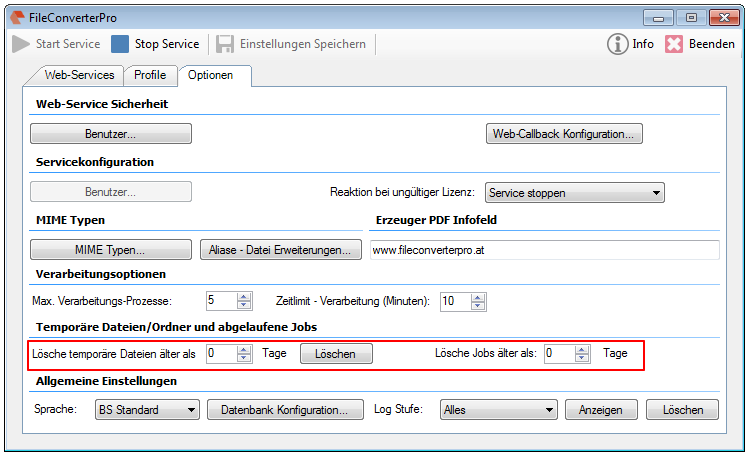 For the conversion with the FC per service several methods are available – the “asynchronous processing” – The file is uploaded and returns a unique job ID immediately. About this job ID, the status can be queried again. If the status is “converted” to change, so the resulting files can be downloaded. Alternatively, there is also the “synchronous processing“ – The file is uploaded, the calling process waits until the conversion is carried out and then gets returned the PDF or the job ID. 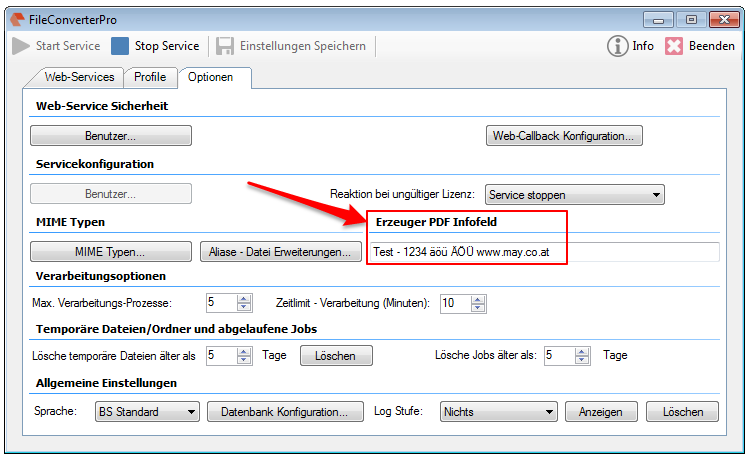 This method returns only the PDF synchronously back – without additional parameters. There is therefore a further synchronous method to also be able to download the other files created. 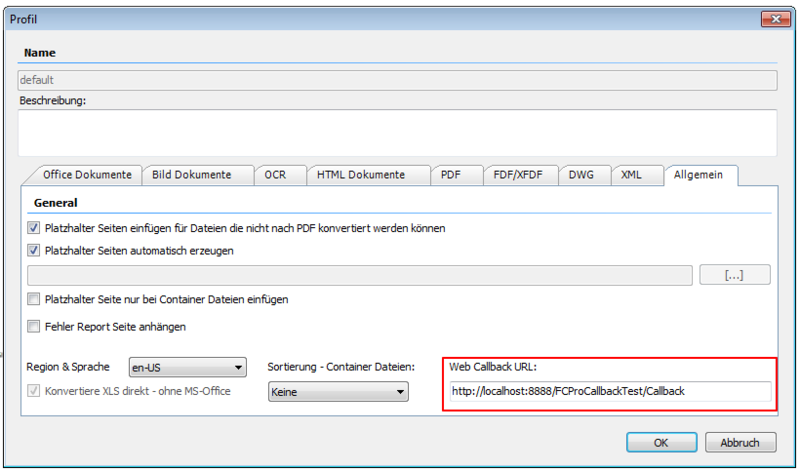 If “Return PDF = true” is set, the PDF will be returned as the result, otherwise the job ID is returned, with which it is possible to download the files with the traditional methods. Synchronous processing can also be tested using the C # / .NET sample client application. In addition to asynchronous and synchronous processing, there is also a third option – processing via web service call back function. Here after processing a previously passed or configured web service URL is called. On a post with a JSON Body to this URL the job ID and the status is transferred. Depending documents – The URL is passed by the upload of the document, which should be called after processing. This overrides the profile-dependent URL. 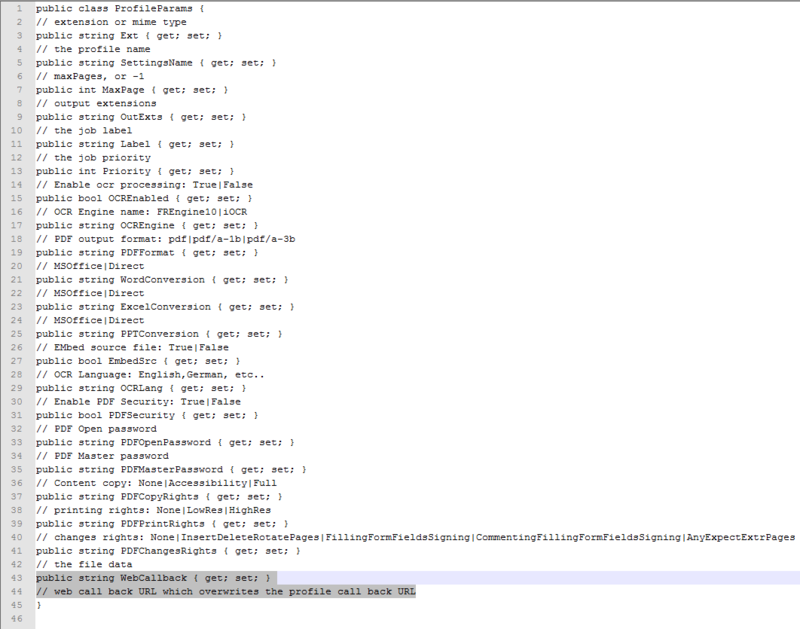 Here a particular JSON encoded structure must be passed to the server. The difference is that in this method, no data file will be added at the end. The attachment is separately posted as formdata / attachment. The UploadJobEx6 method has no parameters. The structure must be passed as a “message body” to this method. In the future, so may be added further parameters for this structure without the signature of the method needs to be changed. 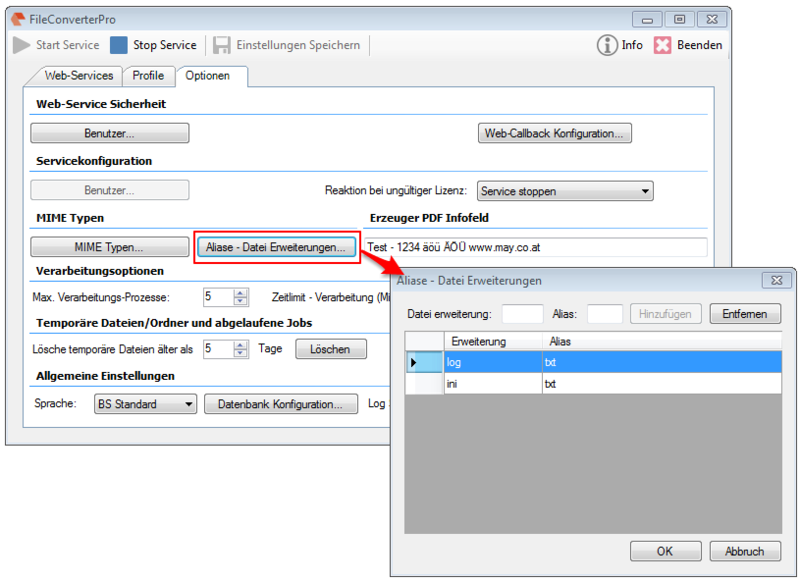 To test the Web–back call function, there is also an installed test application. 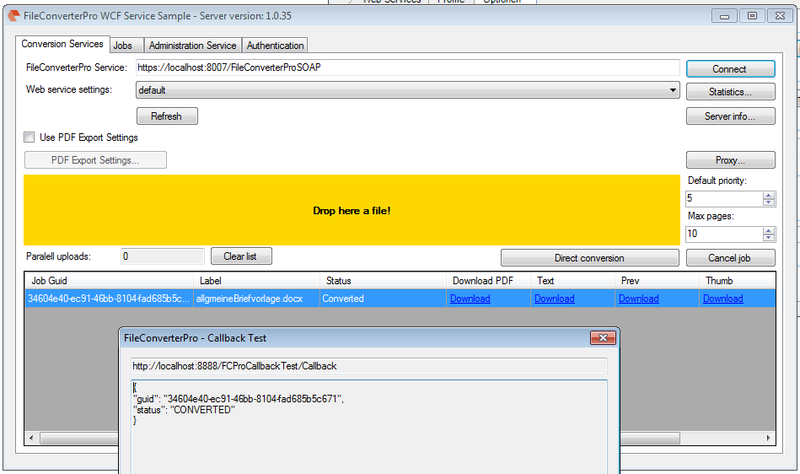 This shows the job ID and the status after the preconfigured callback URL was called.